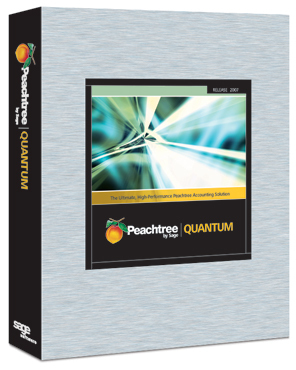 The latest Peachtree by Sage - Quantum 2010 has been released. Designed for growing small businesses that demand accuracy, control, and results from their accounting, Peachtree Quantum also will handle the specialized needs of small manufacturers, distributors, contractors, and nonprofit organizations. Call Edelman Business Systems for more information and/or to purchase Peachtree by Sage - Quantum 2009, Now for 5, 10, 15, 20, 30, or 40 users. Custom built PC's Work Stations and Servers - Check us out! Performance networking - we make it happen. Don't forget to order Peachtree Payroll Tax Update Service! Call us now. Also order Peachtree Forms through us - Invoices, Checks, W2's, etc. Ask about printing multiple Invoice copies on plain colored paper on a laser printer! Peachtree Software by Sage - new release 2010! - Peachtree announces new release for Peachtree accounting solutions series for small business - Peachtree First Accounting 2010 , Peachtree Pro Accounting 2010, Peachtree Complete Accounting 2010*, Peachtree Premium Accounting 2010*, and Peachtree Premium Accounting industry specific solutions 2010*, Peachtree Premium Accounting Accountants Edition 2010*.